Bienvenue à Paris—Welcome to Paris! Honestly, who hasn’t dreamed of visiting the iconic City of Love? Get ready to reap the rewards of this world-renowned destination no matter where you’ve traveled from. Paris offers everything you could imagine from international art and culture to cozy neighborhood cafes. Plus, you’ll stick out like a sore thumb if you don’t heavily indulge in delicious cheese, baguettes and wine during your stay. Get ready to fall in love, because these things to do in Paris will guarantee a special place in your heart for this breathtaking city. Perk up with the sun with an early morning jaunt along the iconic River Seine. 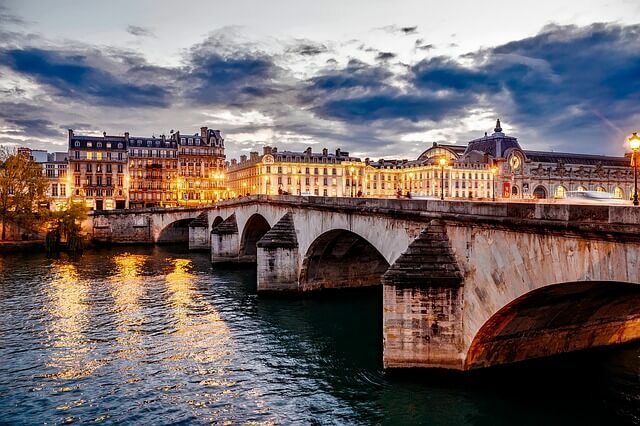 Take in the view of Paris’ downtown from Pont Neuf, the oldest of 32 bridges along the river dating back to the 16th century. Snap a pic of Île de la Cité, the naturally occurring island in the middle of the Seine. Walking not your cup of tea? Easily rent a bike from public bike sharing company Vélib’ and then drop it off at the nearest return station. Let yourself get lost amidst crêperies, cafes and little shops in the small cobblestoned streets of the Latin Quarter. You’ll feel right at home with the crowds here. Sorbonne University, the oldest college in all of Paris, livens up the streets in this district with tons of college students mulling about. 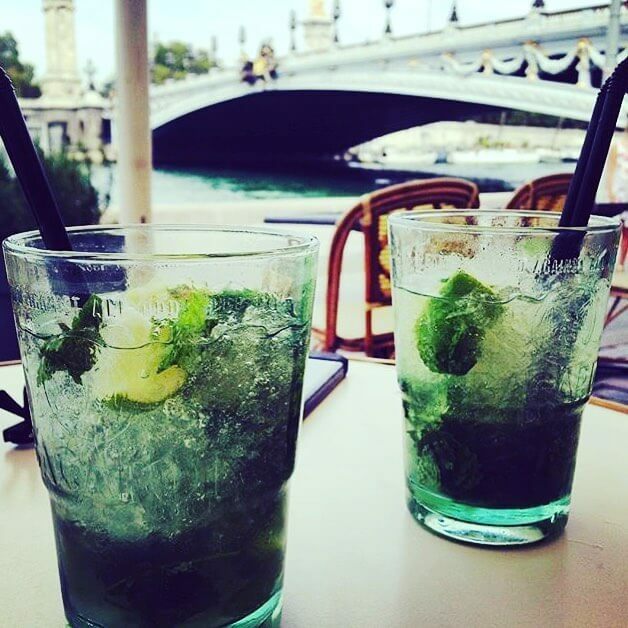 “The Seine is not only a great place to sit and have drinks but also a great place to exercise during the day. The sidewalks along the Seine offer many work out stations with pull up bars and useful equipment for exercising. It’s also a great place to go on a jog, as you don’t have to worry about traffic, and the view is fantastic,” said American University of Paris junior Ava Andrea. If you get to the cathedral early enough, maybe you’ll see the hunchback himself. At the very least, you’ll miss the horrendous crowds that can form later in the day. 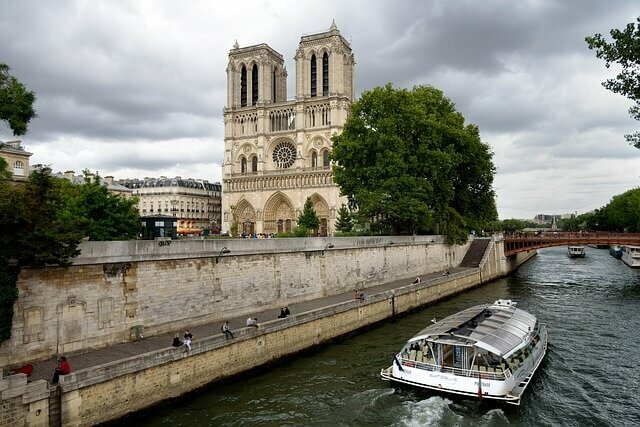 A visit to this medieval Catholic cathedral completes any Parisian tour. This architectural masterpiece took over 200 years to build and dates back to the 12th century. 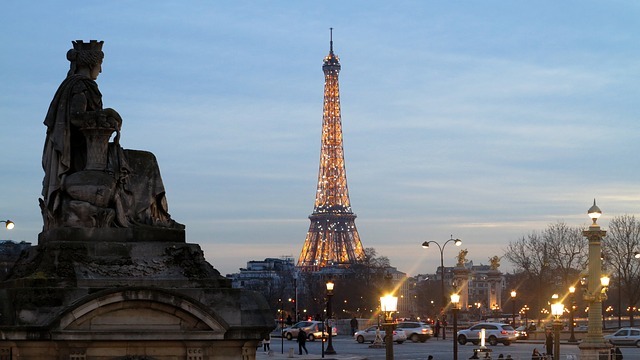 Climb the 140 steps to the bell tower for a gorgeous view of the city along the Seine. Or, check out Sunday mass to let the 17th-century organ transport you back in time. While there, snap a photo of the incredibly detailed stained glass windows for an awesome addition to your Instagram feed. Don’t leave without a visit to the Square Jean XXIII, the park around back, for some prime people-watching as people make their way along the river to work. Pro tip: Square Jean has Wi-Fi. Give your worried mother a call and let her revel in the city views while assuring her that, yes, you’re still alive. “Make sure you hear the bells ring from outside the church. While standing out front waiting for the bells, look at the ground. You can see where the old road used to be and the houses that were demolished to create the square. Also, below Notre Dame is the archaeological crypt. It’s definitely worth checking out!” Chapman University senior Lauren Ogie said. Even if you barely know any French, memorize, “Une crêpe Nutella-banane, s’il vous plait,” (a.k.a. “one Nutella-banana crêpe, please”) and you’ll manage Parisian life like a pro. A visit to Paris means an excuse to eat unreasonable amounts of Nutella. Le Quasimodo Notre Dame offers amazing crêpes at one of the cheapest prices in the Latin Quarter. Order from the friendly employees manning the crêpe cart outside the adorable café and you’ll soon know why Parisians obsess over this flakey pastry. Not a Nutella lover? 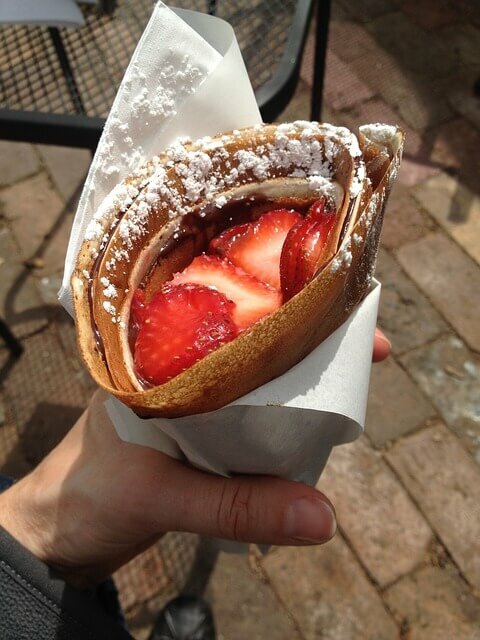 Choose something else from the extensive menu like a crêpe drenched in salted caramel butter or a ham sandwich. “My favorites are the Speculoos crêpe and the sugar and lemon crêpe,” Ogie said. At first glance, you might wonder if you even need to go inside to find art. With air vents, electrical cables and pipes making up part of the museum’s exterior, the building itself screams modern art. Browse through work by internationally acclaimed artists like Henry Matisse and Jean Dubuffet. Or, gain a new perspective from one of the ever-rotating visiting exhibits. Centre Pompidou even includes the perfect study spot: a huge public library spanning two and a half floors of the museum. “I love to go to the Centre Pompidou library to study. They have every single resource you could need,” AUP junior Greta English said. Plus, score an awesome view of the Eiffel Tower among the Paris rooftops from the top floors. 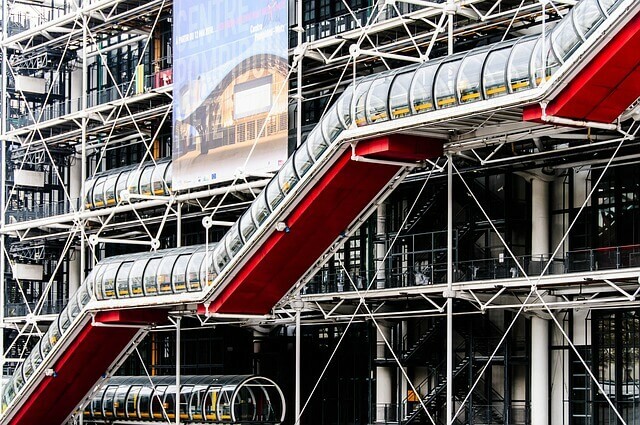 “Pompidou is great for the view and if you’re a fan of unique modern art,” AUP sophomore Katie Zambrano said. Religious studies majors, prepare to have your minds blown. Here, you’ll discover more than 1,000 biblical scenes displayed across fifteen 15-meter tall windows. Trust me when I say you’ve never seen stained glass like this before. Parisians purportedly constructed this testament (no pun intended) to Gothic style to house important Christian artifacts like Christ’s crown of thorns in 1248 C.E. UNESCO dubbed this royal chapel a World Heritage Site, so be sure to include Saint-Chappelle’s international acclaim in your hashtags on Twitter. “Saint-Chappelle is really a hidden gem that a lot of people overlook but once you step inside it’s truly breathtaking,” Zambrano said. 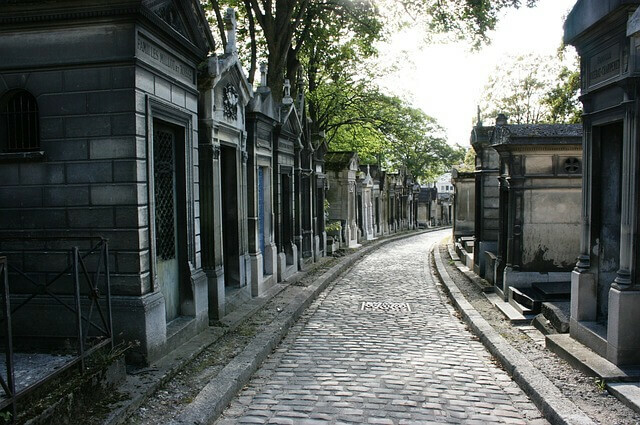 You might not be used to visiting cemeteries as tourist attractions, but a stroll through Père Lachaise will quickly change your mind. Parisian cemeteries go beyond just tombstones. They look like incredible works of art with ornate marble tombs and decorated mausoleums. The winding paths will lead you past the burial spots of all sorts of legends like author Oscar Wilde and singer Jim Morrison. Freaked out by the dead? Don’t be. You’ll find plenty of Parisians leisurely stretching their legs through the grounds. No big deal. “Père Lachaise has an eerie silence that feels sacred because of all the icons buried there,” AUP junior Cassandra Ovalle said. We all know cheese easily ranks as one of the best foods known to man. 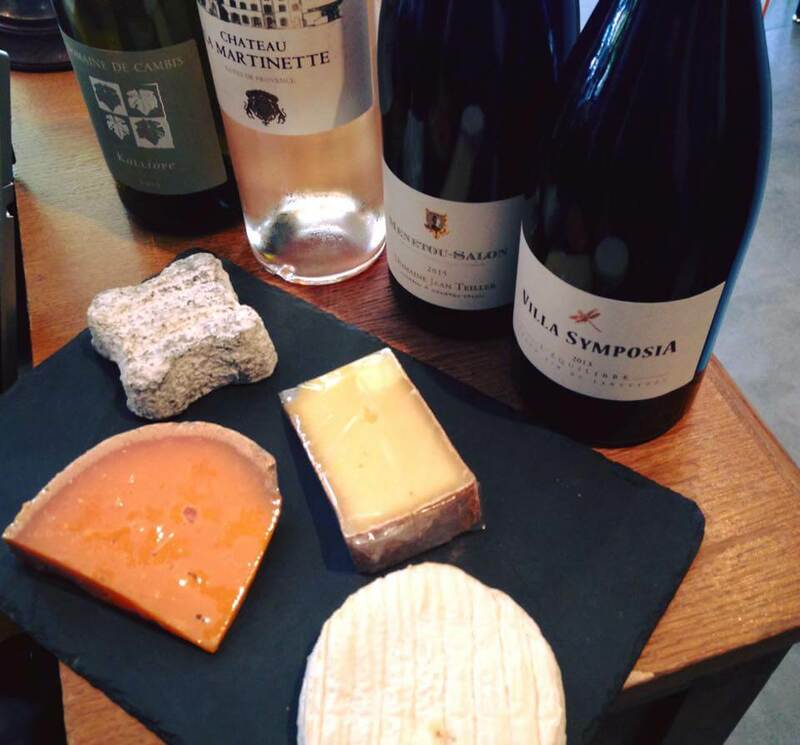 Friendly experts run this unpretentious wine and cheese bar in Paris’ 10th arrondissement, one of the 20 zones dividing Paris into different neighborhoods. Follow their advice for an astonishing wine and cheese combination your taste buds will never forget. Treat yourself to a cheese and meat platter and un verre de vin (a glass of wine). Hey, it’s 5 o’clock somewhere. “Absolute top quality products guaranteed. Most if not all of the wines and cheeses are French, and some are made just outside Paris,” AUP of Paris junior Sarah Sturman said. Act like a true Parisian and grab a baguette, lunch meats and cheese from the grocery store for a picnic lunch in this picturesque garden. King Henry IV of France’s widow Marie de’ Medici created the Luxembourg Gardens in 1612 but they remain a Parisian hotspot today. 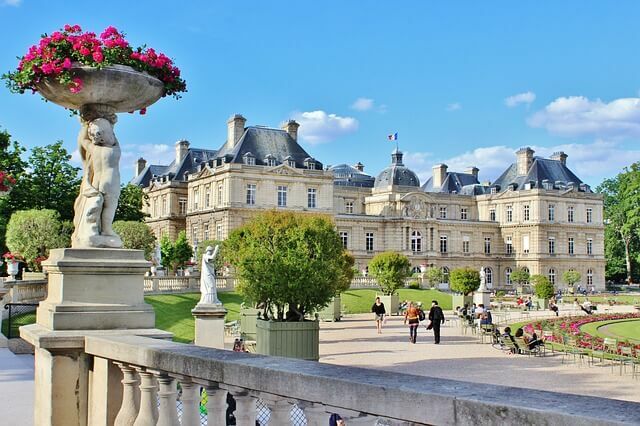 Bring a book and get lost in its story while lounging in the grass out front Luxembourg Palace. “Luxembourg Gardens is my favorite place to go have lunch and read a book. There are many different aspects to the garden so you can go multiple times and have a different experience each time,” Ogie said. Peep the French politicians mulling about; the palace functions as the working place for the Senate. Once you tire of politics, make a game of finding all 100 statues distributed throughout the 61-acre expanse or mingle with the locals over a game of chess. “The Luxembourg Gardens are a perfect place to take Instagram pictures and chill out on a nice day. My friends and I love to bring our homework there and work. There are so many cute little areas,” English said. Prepare for a food battle even more cutthroat than when Cupcake Wars premiered on Food Network. 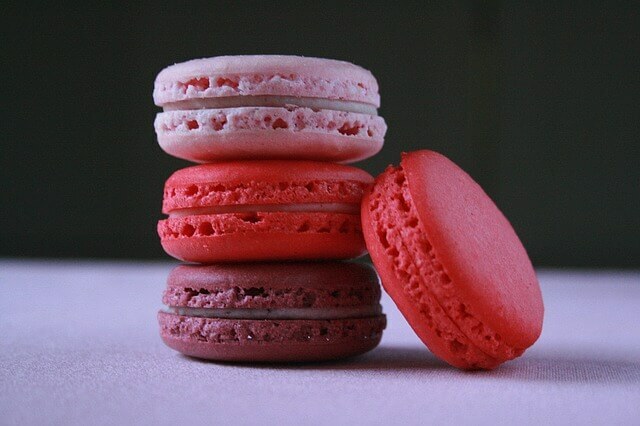 In Paris you’ll notice fierce rivalry for the title of best macarons in the city, but most agree Ladurée takes the lead. The recipe hasn’t changed since the first shop opened in the mid-19th-century, so obviously they’re doing something right. Build your Snapchat-worthy box of macarons with classic flavors like raspberry and orange blossom. Or, spice it up with a pick from the rotating seasonal selection featuring flavors like coconut lime and candy strawberry. Don’t think too hard. You really can’t go wrong in this shop. “Macarons from Ladurée are truly the best in Paris. You’re not really in Paris until you get macarons from here,” English said. 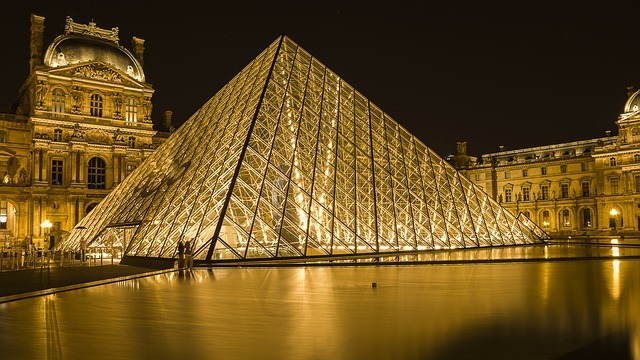 You may recognize the world-famous glass pyramid from The Da Vinci Code but you’ll be even more impressed when you see it in person. Consider this museum the ultimate crossroads of history and art. The extravagant building originally functioned as a medieval fortress for King Phillipe August back in 1190. You won’t find a larger art museum anywhere else in the world. You can look through more than 70,000 pieces of art in diverse departments like Egyptian Antiquities and Islamic Art. Make like Jay-Z and Beyoncé and take a selfie with the Mona Lisa, or browse the underground shopping concourse connected to the museum when you’ve had your fill of art. “The Louvre was so cool. The Mona Lisa was smaller than I had thought but it was definitely worth seeing. Also, the rest of the art there is unbelievable,” Temple University 2016 grad Genna Pyles said. With hot chocolate this tasty, you’ll want to try some even if you’re visiting Paris in the middle of summer. This tea house in Paris’ first arrondissement serves a to-die-for steaming cup of hot chocolate with an almost pudding-like consistency. According to the rumor mill, this used to be one of fashion designer Coco Chanel’s favorite spots in all of Paris. Take a seat at one of the tables draped in white cloth and pair a buttery croissant with your drink in true Parisian fashion. 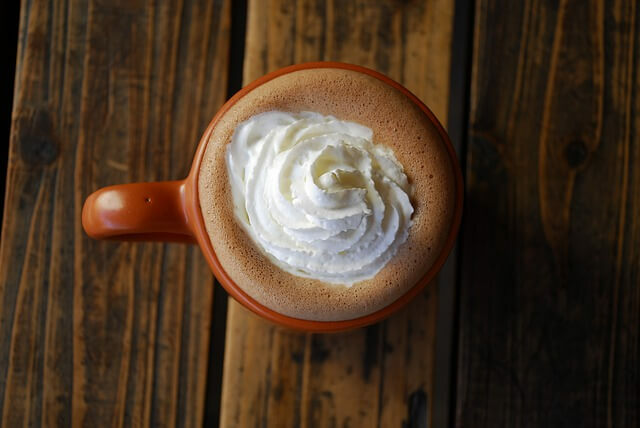 “Angelina’s hot cocoa is literally the best thing in the world, from the pot full of thick chocolate they provide you to the whipped cream to top it off,” Ovalle said. You can also order a cup pour emporter (to-go) and take it across the street for an afternoon jaunt through the Tuileries Gardens. “Everyone should visit the Tuileries when they’re in Paris. There are lots of chairs around the fountains, so you can bring lunch and eat [there]…It’s also close to Place de la Concorde, which has a giant Ferris wheel with a phenomenal view of the city,” AUP junior Ava Andrea said. Does an art museum housed in a 19th-century railway station sound almost too good to be true to your inner art enthusiast? Sometimes, dreams do come true. You’ll find Musée d’Orsay at former train station Gare D’Orsay right along the Seine River in the seventh arrondissement. Your mom may love the rendition of Vincent Van Gogh’s Starry Night your teacher made you paint in elementary school but here you can see the real thing. Fun fact: you may know the Starry Night on display in New York’s Museum of Modern Art, but Van Gogh actually painted the Parisian La Nuit Étoilée (Starry Night) first. The French rendition includes a couple hanging out by the water at night. “The Musée d’Orsay’s collection of Impressionist art and the building itself are amazing,” Ogie said. 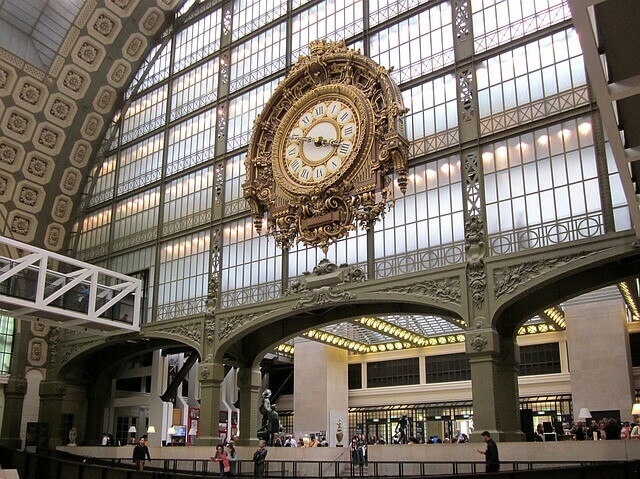 Don’t miss a remarkable view of Paris from the giant clock face on the top floor. Looking for an escape from the hustle and bustle of central Paris? Take in the sunset away from the downtown crowds in this unique park situated in Paris’ northeast 19th arrondissement. Get lost following the trails through the woods. The various waterfalls in quarries across the site will have you feeling like you live in a French painting. Then, cross the old train track bridge and climb up the cliffs to Temple de la Sibylle. Paris’ city architect Gabriel Davioud modeled the temple after the Temple of Vesta in Tivoli, Italy. It sits atop Île de la Belvédère in the center of the park’s lake and offers a view of the city you can’t get from downtown. If you’re visiting in summertime, stop in for a drink at the cool patio bar nestled away in the back of the park. “Parc des Buttes Chaumont is huge and beautiful! In the summer I would grab a book and go lay out in my swimsuit and sun bathe …You can also look at the Couchsurfing app for English-speaking events here,” TV and Cinema Academy 2017 grad Rachel James said. 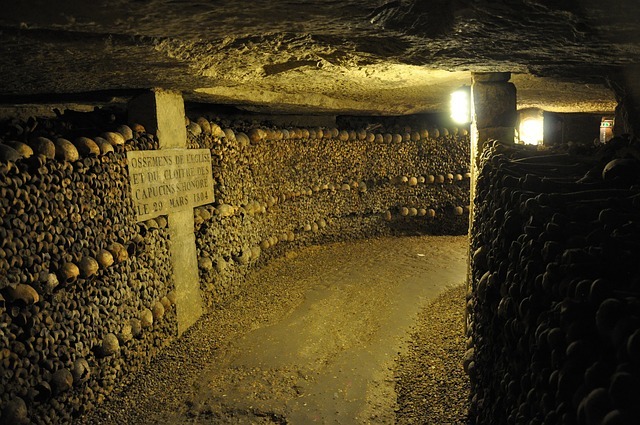 “The Catacombs is by far one of the best things I’ve done in Paris. It is so beautiful in an eerie way but I really loved it. You do have to wait a while to see it, so stay strong and just wait because it is amazing!” University of Washington 2015 grad Hannah Smith said. Horror fanatics, raise your hands. Believe it or not, while you’ve been walking around experiencing the time of your life all day a literal city of bones sprawled out beneath your feet. Maybe you’ve even seen one of the several horror movies made about this very spot. The remains of more than six million people make up this two-kilometer long underground network of ossuaries below picturesque Paris. Wander these subterranean caves and marvel at the wackiness. Bonus points if you make it to the end without feeling faint. Feeling homesick? Maison Péret’s warm, welcoming atmosphere will quickly chase those feelings away. 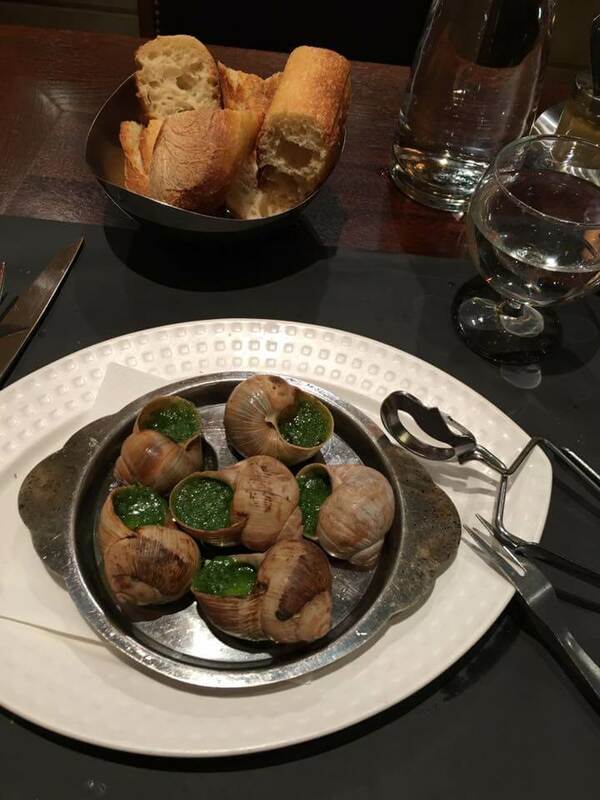 Discover this friendly neighborhood bistro located in Paris’ charming 14th arrondissement. The vaulted ceiling, wood paneling and old French paintings fill this place with traditional Parisian vibes. The local dishes made with fresh ingredients like Pescadou, a smoked French trout, and Aubrac, dried sausage smothered in delicious local cheese, will be your new favorites. Don’t forget to ask for the perfect wine pairing with your meal. Maison Péret offers more than 50 wines from France’s top vineyards. Bibliophiles, you’ve found your Mecca. George Whitman, the original owner of this legendary English-language bookstore opened its doors in 1951. Whitman used to let travelers stay in the store as long as they were writing. The creative folk who passed through were nicknamed Tumbleweeds. “Shakespeare and Company is good and not too expensive. It’s very quaint compared to some of the larger commercial stores,” Vienna University of Economics and Business graduate student Richard Sentinella said. If you’re looking for a really interesting read, ask a staff member to check out the original first-person accounts from the Tumbleweeds on their time at the bookstore and in Paris. 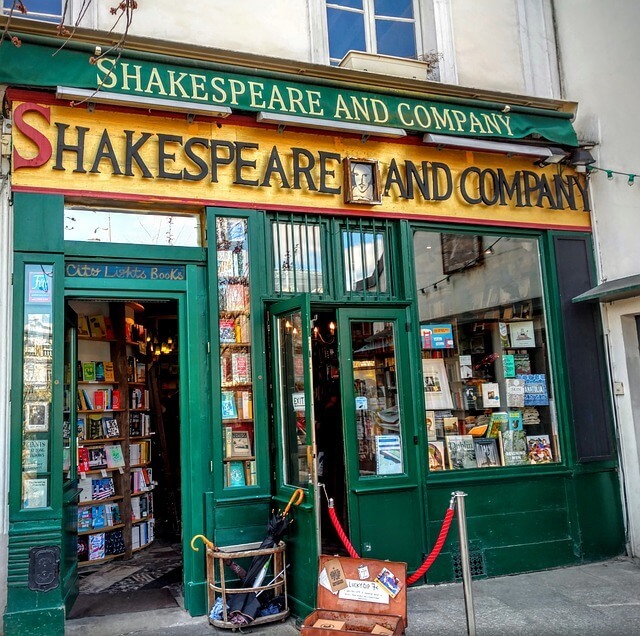 Once you exhaust that collection, pick out a book from Shakespeare and Company’s seemingly endless selection. When you check out, you’ll get a stamp on your book to prove to the world you bought it at this legendary bookstore. Take your newest read to the cozy couches upstairs and cuddle up with the friendly bookstore cat for a good read in a writer’s wonderland. Sit back, relax and sneak a peek at Notre Dame Cathedral through the window. Just in case you weren’t completely sold on Paris already, here’s a fun piece of trivia. While you’re here, you don’t have to fret about open container laws. Bring a few bottles of wine or buy some beer from the peddlers on the Champs de Mars and lay out in the grass. You can even check up on your social media accounts with the free public Wi-Fi. No matter how many times you’ve seen the Eiffel Tower on TV, you’ll be awestruck when you see it in person. Be sure to show up on time: The massive structure lights up every hour on the hour in a one-of-a-kind breathtaking light show you’ll never forget. “Go sit in front of the Eiffel Tower at night. It’s so peaceful and seeing the tower light up without hundreds of tourists around is really amazing,” James said. Need a quick pick-me-up before hitting the town for the night? Drop by Les Deux Magots for a bit of caffeine or a snack among literary history.“Les Deux Magots is great for people watching in the summer. Saint-Germain-des-Près is a beautiful area, so stopping at Les Deux Magots to people watch and take in the neighborhood is something everyone should do at least once,” AUP junior Savannah Stone said. Existentialists Jean-Paul Sartre and Simone de Beauvoir visited Les Deux Magots every day during World War II to write for their political movement. The café reserved special tables for each of them for their frequent coffee stops. 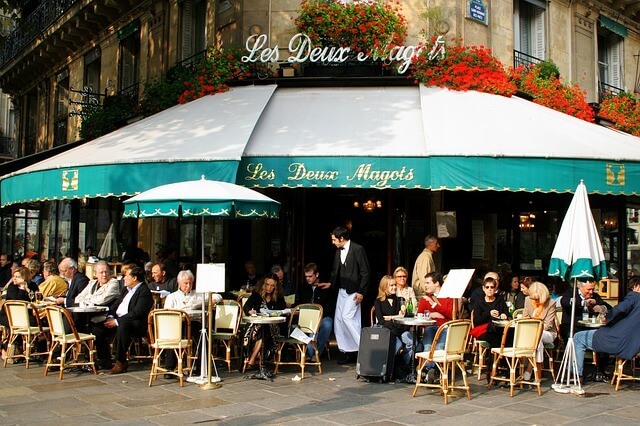 You’ll find Les Deux Magots nestled roughly halfway between the Luxembourg Gardens and Musée d’Orsay. This famous café in Saint-Germain-des-Prés also used to be a hotspot for intellectual elite like Ernest Hemingway and Pablo Picasso. Nibble on a plate of Normandy Camembert cheese or a mouthwatering chocolate mousse. Or, soak up the creative historical atmosphere while nursing a cappuccino. You might even leave with a new creative endeavor or two of your own. Party along the banks of the Seine at Faust. Faust’s décor includes traditional Parisian styles like street lamps from the 1900s, retro black and white floor tiles and vintage metal beams. Sip your old fashioned or cosmopolitan in the chic indoor atmosphere reminiscent of the Jazz Age or head to the outdoor seating area. You’ll find the patio underneath Pont Alexandre III, the bridge many Parisians dub the most beautiful in the city. Try something worth writing home about with the Kiwi Collins, a vodka drink made with fresh lime, kiwi and lemonade. “Faust has the best view out of all the bars on the river and it has a fun upscale vibe to it,” Andrea said. Grab a beer and a racket and put your skills to the test at one of the eight ping pong tables in this two-level bar. Plus, beer plus ping pong balls equals beer pong, even in a foreign country. Show everyone what you’ve really been learning at college and battle your way to the title of international beer pong champion. If you can’t handle any more beer after a few rounds, order one of the bar’s flaming shots (yes, they are literally on fire). This wacky joint even offers charcuterie and cheese trays, because why wouldn’t a French ping pong bar do that? If you’re really feeling confident, try a game in one of the black light rooms for the ultimate challenge. Put on your dancing shoes because Le Batofar doesn’t stop until 7 a.m. Club in style at this nightclub on a literal boat in the 13th arrondissement. Sip a chilled glass of wine while floating atop the Seine and watching a live music show. The quirky interior features multi-colored lights and electronic dance floor visuals for a night you won’t forget. 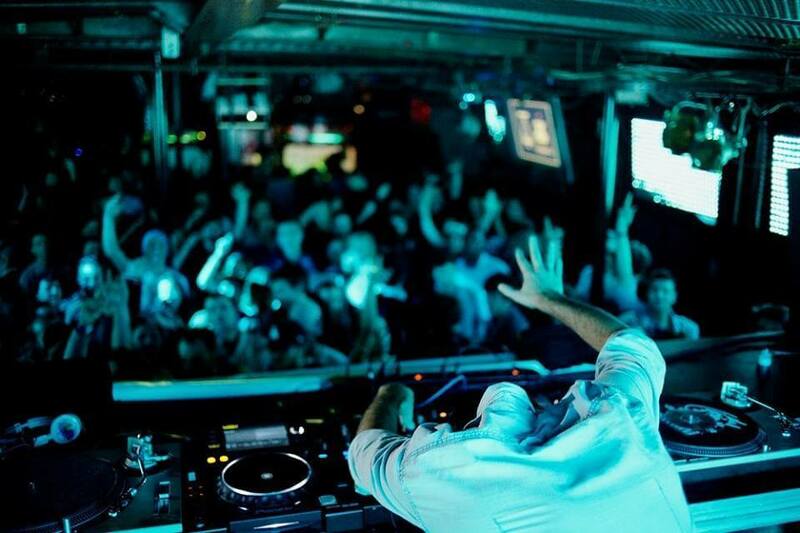 The lively ambiance comes at a surprisingly affordable price compared to other clubs in downtown Paris. Come for the band of the night, then stay for the afterhours DJ dance parties. Take a breather on the boat deck if you need a bit of sea breeze to perk you back up. You’ve truly come a long way from your school’s favorite frat house’s weekend mixers. If your stomach won’t stop growling after you danced your heart out, you’ll love Le Grand Café. Look out for tomorrow’s hangover and soak up your drinks with food from this 24-hour spot downtown. Le Grand Café opened in 1875 and has been essential to Parisian night owls’ survival ever since. Sink into one of the plush velvet chairs and give your tired feet a break. 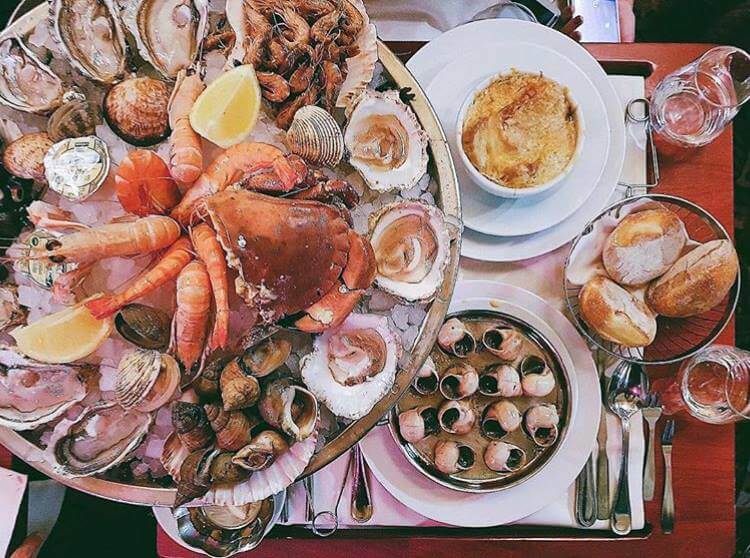 Try a light snack like homemade French fries or foie gras or go all out with a full meal from the extensive menu. Treat yourself. It doesn’t have to be New Year’s for you to turn your year around. 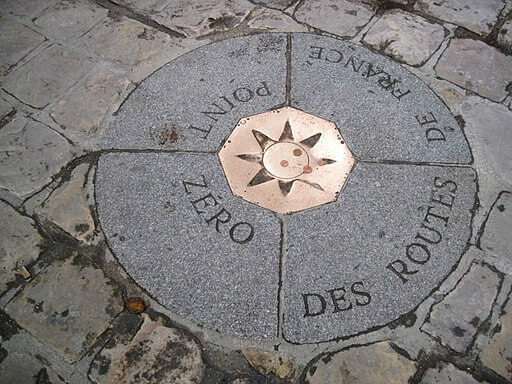 Re-explore the Latin Quarter by night and pay a visit to Point Zero. This spot near Notre Dame Cathedral supposedly marks the very center of Paris. Locals have all sorts of wacky good luck rituals associated with the marker. Rub the center of the brass plate for good luck or leave behind a shiny coin in exchange for your deepest wish coming true. After today, I wouldn’t be surprised if you wished for a longer stay in Paris. Wind down from your jam-packed Parisian day with a leisurely stroll along Canal Saint-Martin in northeast Paris. The adorable footbridges and 19th-century waterway connecting to the Seine make for an artsy shot to really up your Insta story game. Treat yourself to some early morning people watching. Wonder how Parisians look so stylish even at 5 a.m. while walking their dogs when you go to 10 a.m. lecture in sweatpants. Some of life’s mysteries just can’t be solved. 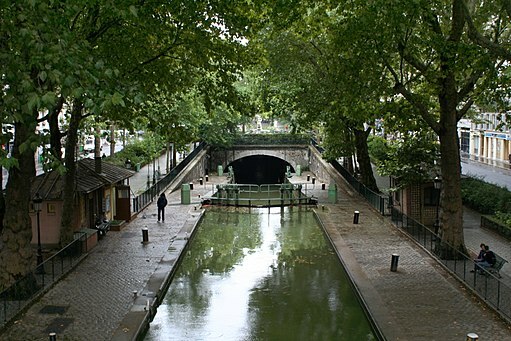 “Canal Saint-Martin has a really cool vibe. When people tell me they want to go shopping in an area that has small boutiques I send them there. There are also a ton of great restaurants. There’s even a pizza place that delivers right on the street of the canal,” Stone said.